To password protect an entire domain or folder within your website, firstly log into your account (hostControl). 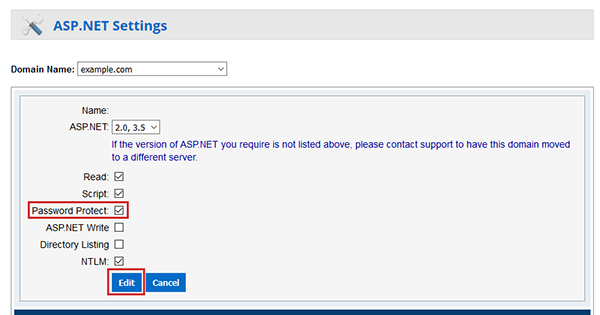 Then select the "ASP.Net Settings" menu item from under the "Advanced" section of the menu. Choose the domain name from the top dropdown list. Find either the domain or folder you wish to password protect and select "Edit" to the far right of it. If you would like to password protect the whole domain name, click "Edit" to the right of the very first row where it is blank under the 'Name' column. Tick the checkbox next to "Password Protect" to enable and select "Edit" to save. Your domain or folder is now password protected. This will password protect the domain or folder with its FTP Account username and password. When you browse to the domain or folder in your web browser, it will prompt for a username and password. This will be the username and password of the FTP account that the domain is located on. Visit the "FTP Accounts" section to find the username and password. Manual usernames or passwords cannot be given unless you create an FTP account to coincide with it (See how to setup an FTP Account). This can be installed for an additional fee of $29.